Ray Skillman Discount Chevrolet’s long history serving the community of Indianapolis has led us to become one of the most recognized and trusted car dealers around. Whether you’re searching for a new truck from the legendary 2018 Chevrolet Silverado series, or you want to find the perfect finely-tuned Chevy Corvette sports car, we have the vehicle for you. We continue to gain the respect of the community through our commitment to great service, a variety of on-site financing options, and thorough knowledge of each vehicle we sell. 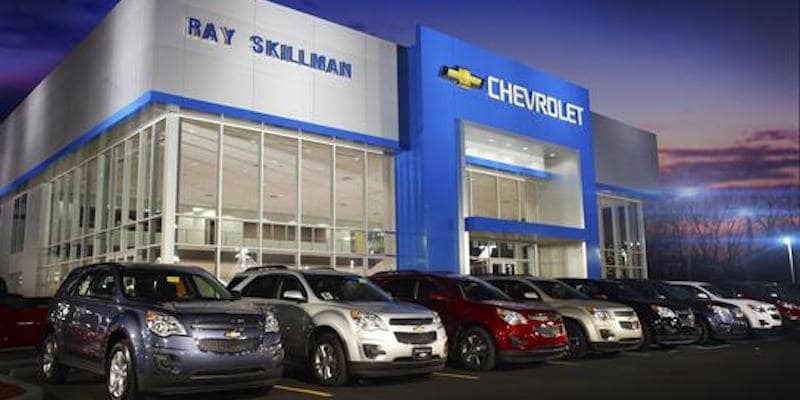 At Ray Skillman, we are proud of our extensive knowledge of Chevy vehicles, and of our unbeatable selection of New Chevrolet Vehicles. From basic specifications to luxurious available features, we can guide you to the exact model you need for your lifestyle and preferences. For active families, we have plenty of options for the new 2018 Chevrolet Equinox SUV. If you’re shopping for a daily commuter, we’d be happy to show you the 2018 Chevy Malibu, with technology and style updates. No matter if you’re shopping for a new car, or checking out some high-quality Pre-Owned Vehicles, we want you to be happy with your purchase. That’s why we also provide complete vehicle histories for all of our used vehicles, including owner history and incident reports. With this information, you will be able to trust the quality of the vehicles we sell. When it comes to financing, the team at Ray Skillman Discount Chevrolet is here to help. We want you to get behind the wheel of your dream car as soon as possible, which is why we offer a variety of on-site financing options to help you fit your new purchase into your budget. From loans to leases and more, we have the perfect option to help you get the most out of your purchase. Let our knowledgeable compassionate sales staff show you the Chevrolet vehicle of your dreams, and our expert Finance Department will show you just how easy it can be to drive it home today! Routine maintenance is one of the most important ways you can keep your vehicle running great year after year, which is why the Ray Skillman Chevrolet Service Center offers a complete range of maintenance and repair services. From oil changes to brake replacements to major repairs and more, we will keep your vehicle in top-notch shape for any season. We will help you select and replace tires, add on custom accessories, and outfit your vehicle for mobility assistance. When you need the right parts installed by the right professionals, we are here to help. We offer these comprehensive maintenance services for all of our models, ensuring that your pre-owned Chevy stays in excellent condition, or your new Chevrolet stays as prime and pristine as the day you drive it off the lot. There’s more to a vehicle demonstration than picking out colors and taking a test drive. At Ray Skillman Discount Chevrolet, we want you to know everything that’s important to YOU in your next new car. The Chevy brand is uniquely positioned in the Indianapolis market to satisfy the needs of practical driveling fans everywhere. Chevy has the proper mixture of strong performance and sleek style that’s appealing to all of Indiana. Our team is here to make sure you’re aware of every feature, tip, and maintenance best practice because we take pride in delivering the ultimate shopping experience for our customers. Watch this video to get your engine revving for incredible savings and an incredible experience shopping for your new Chevy, and then let the Ray Skillman Chevrolet team take care of the rest. Attention to detail is important. You won’t miss a thing when you shop at Ray Skillman Discount Chevrolet. We’ll make sure of it.